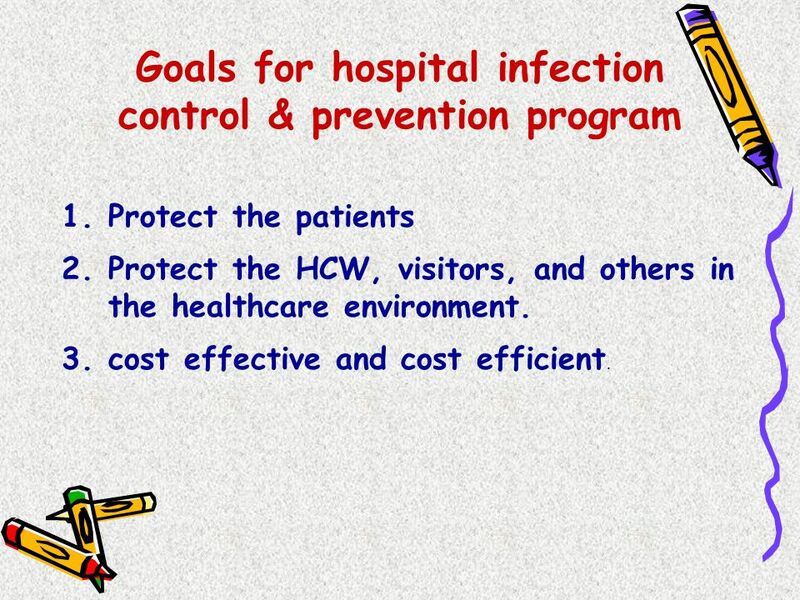 Protect the patients Protect the HCW, visitors, and others in the healthcare environment. 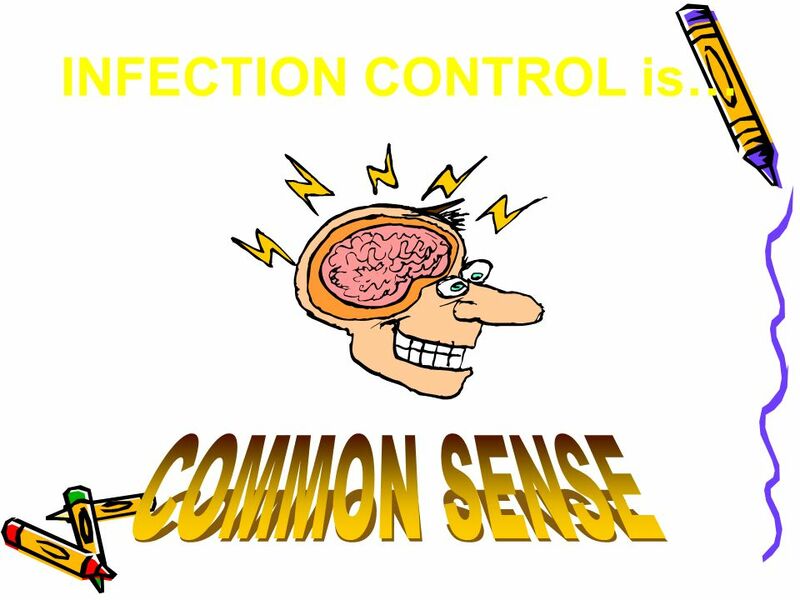 cost effective and cost efficient. 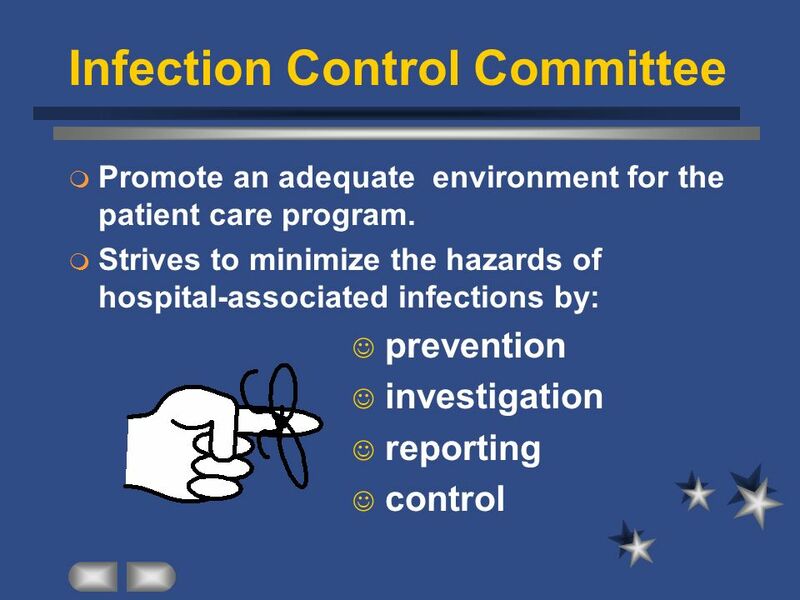 Annual plan for infection control Infection control policies. 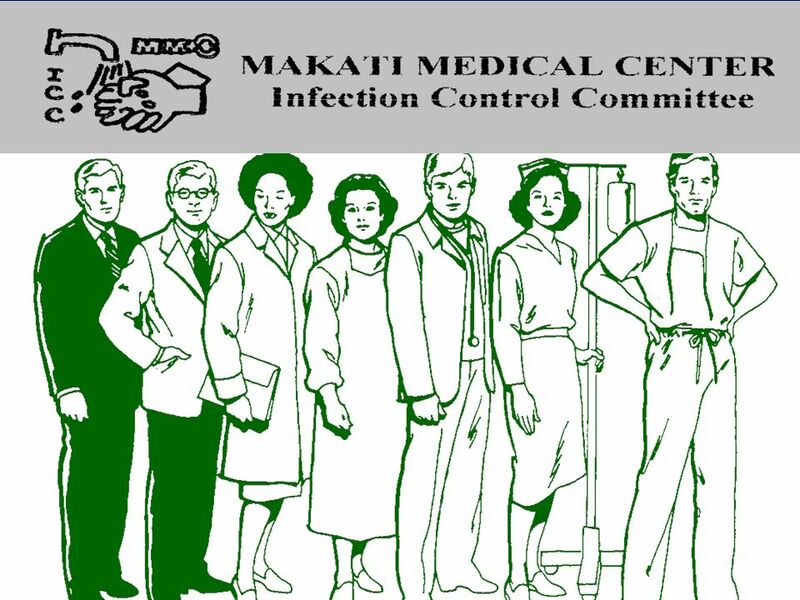 Support the IC team & direct resources to address problems as identified Ensure availability of appropriate supplies Review epidemiological surveillance data & identify area for intervention. 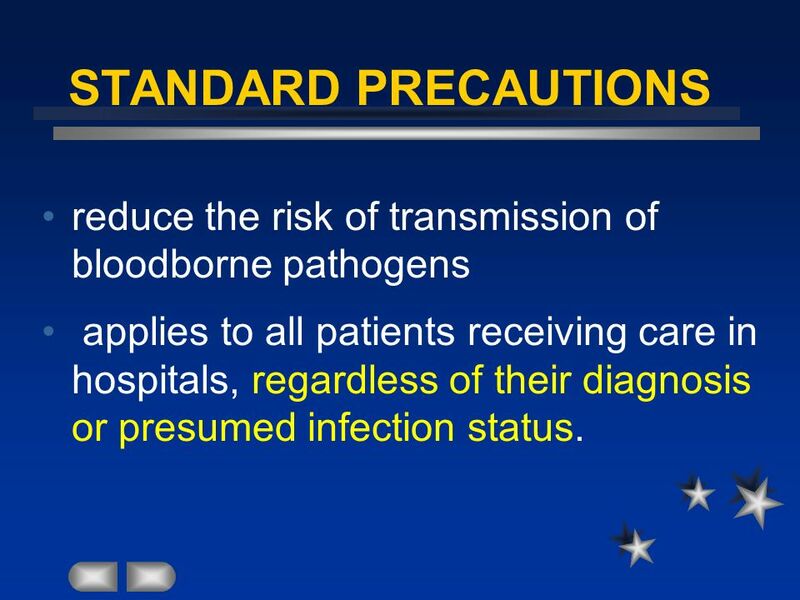 10 STANDARD PRECAUTIONS reduce the risk of transmission of bloodborne pathogens applies to all patients receiving care in hospitals, regardless of their diagnosis or presumed infection status. 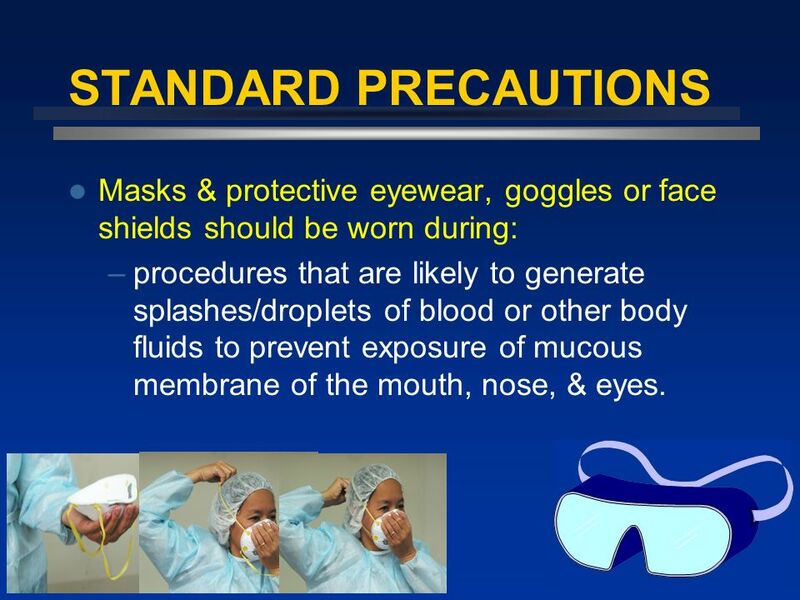 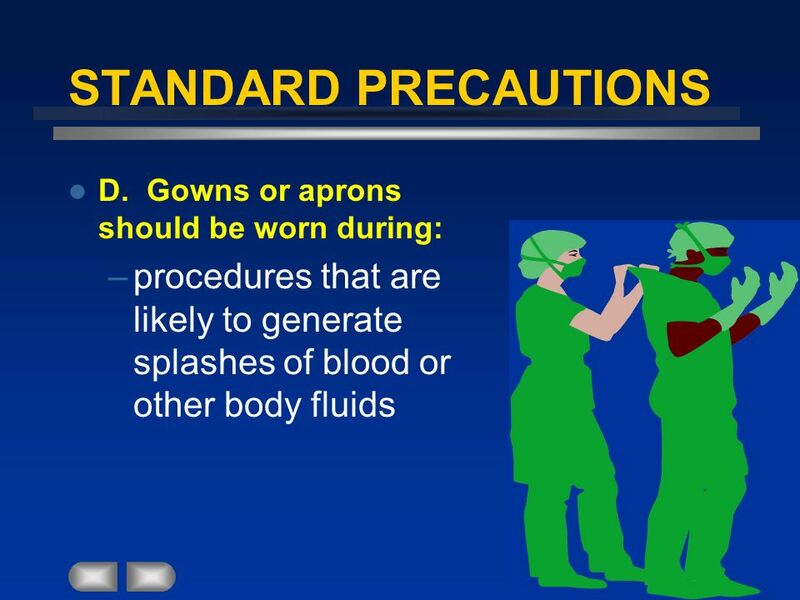 19 STANDARD PRECAUTIONS Masks & protective eyewear, goggles or face shields should be worn during: procedures that are likely to generate splashes/droplets of blood or other body fluids to prevent exposure of mucous membrane of the mouth, nose, & eyes. 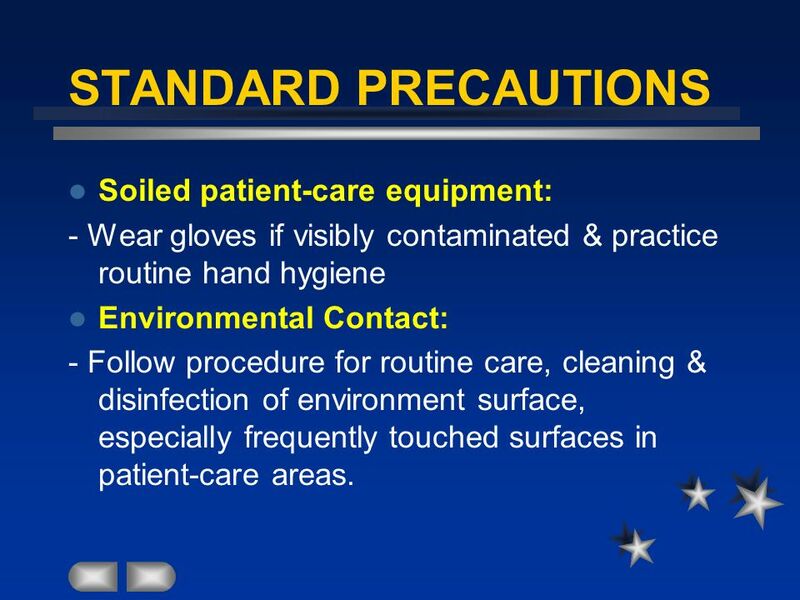 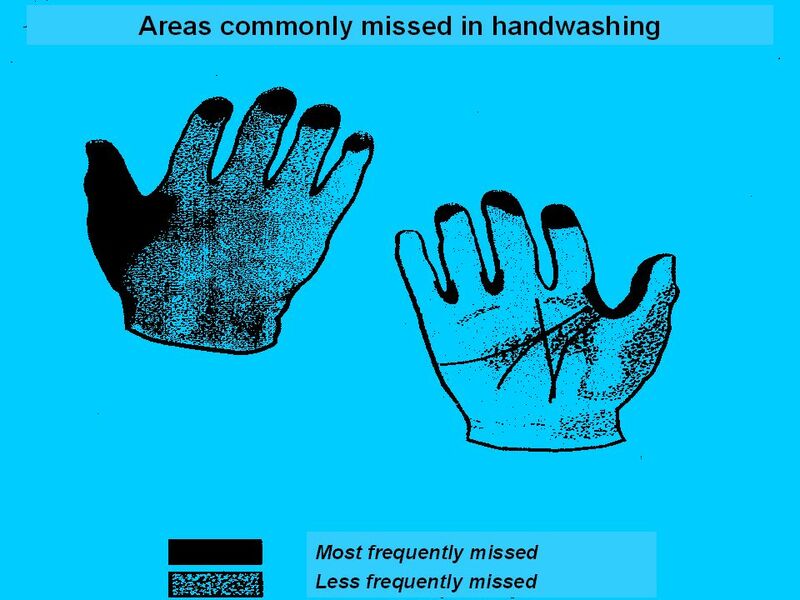 - Wear gloves if visibly contaminated & practice routine hand hygiene Environmental Contact: - Follow procedure for routine care, cleaning & disinfection of environment surface, especially frequently touched surfaces in patient-care areas. 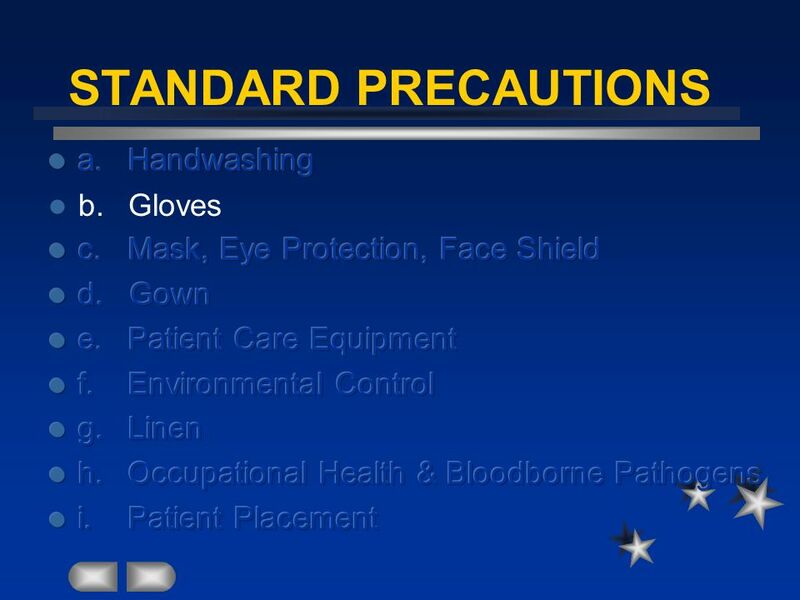 -Always use gloves when handling linen. 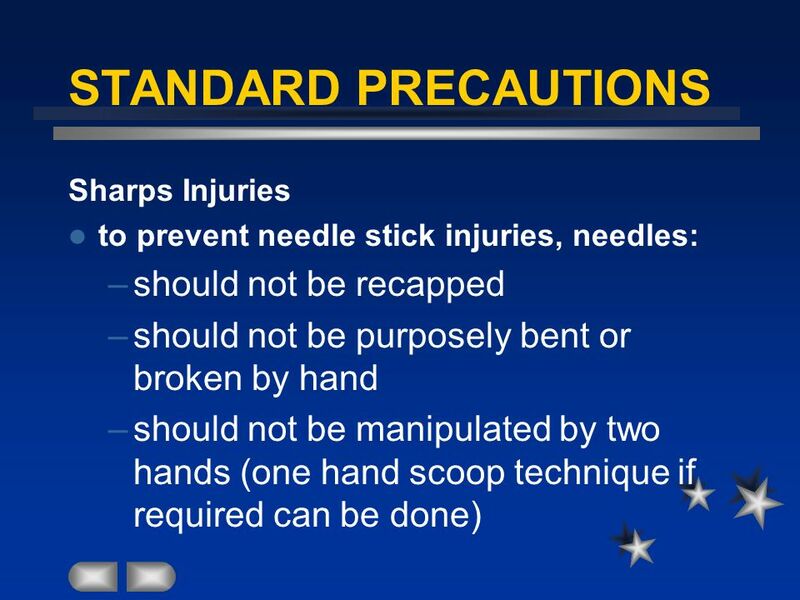 -Inspect for needles, syringes, etc while stripping. 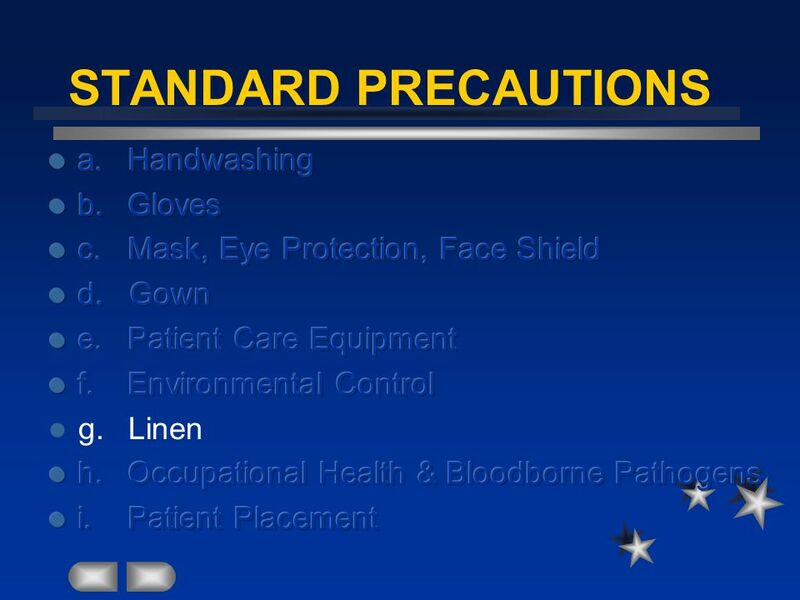 -Linen should not be placed on the floor. 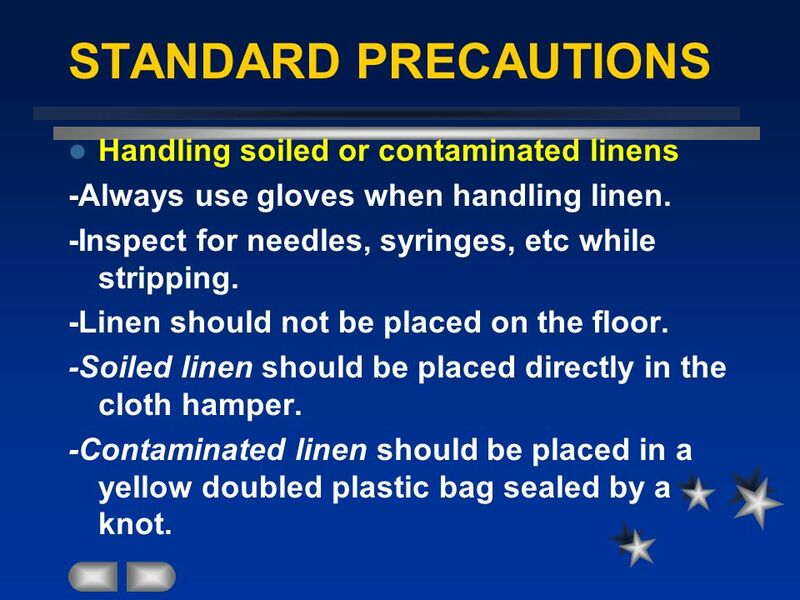 -Soiled linen should be placed directly in the cloth hamper. 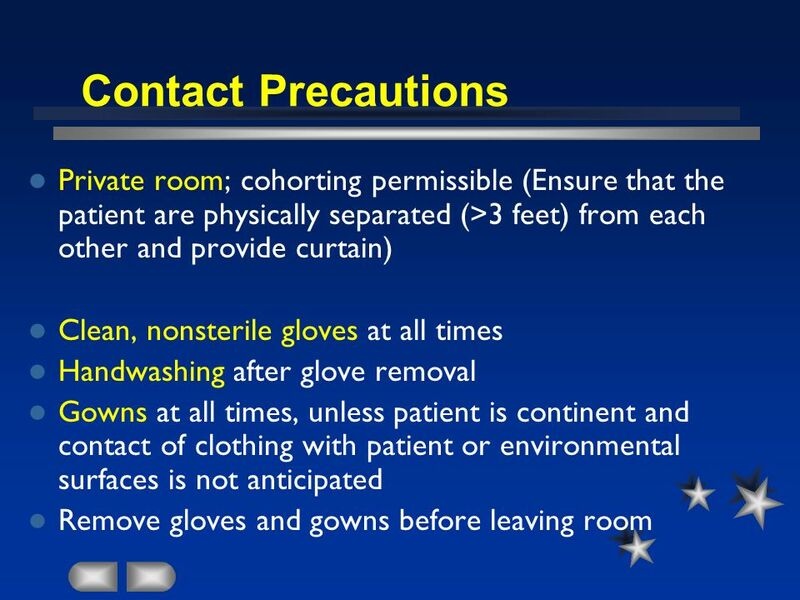 -Contaminated linen should be placed in a yellow doubled plastic bag sealed by a knot. 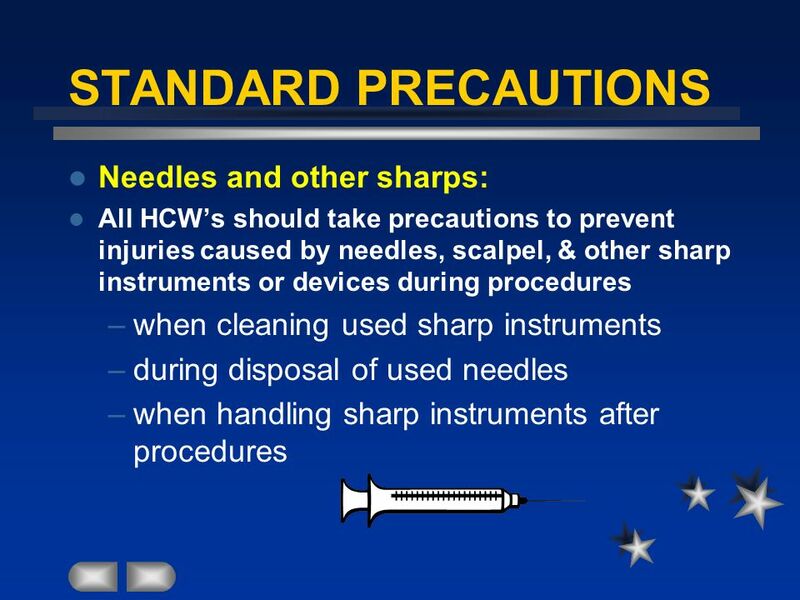 To prevent injuries when using needles, scalpels, & other sharp instruments or devices Never recap used needles Place used disposable syringes & needles, scalpel blades, & other sharp items in appropriate puncture-resistant containers for transport to reprocessing area. 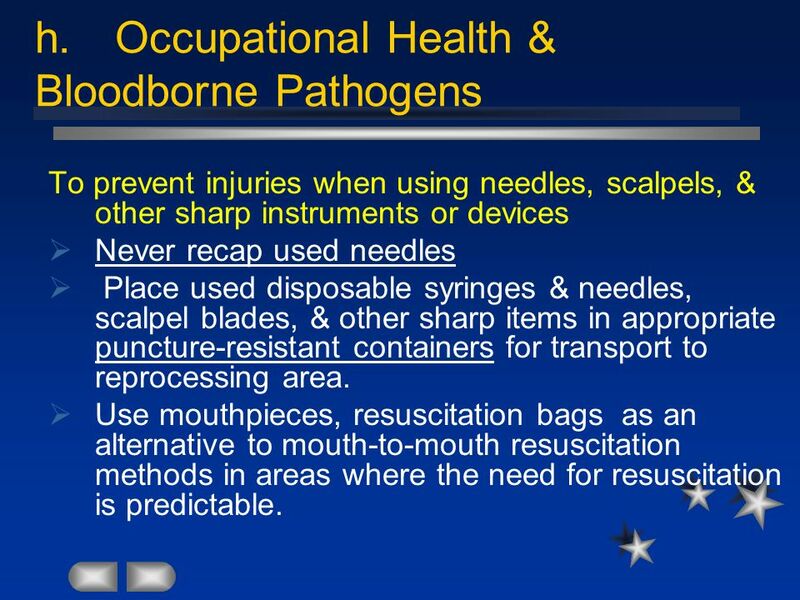 Use mouthpieces, resuscitation bags as an alternative to mouth-to-mouth resuscitation methods in areas where the need for resuscitation is predictable. 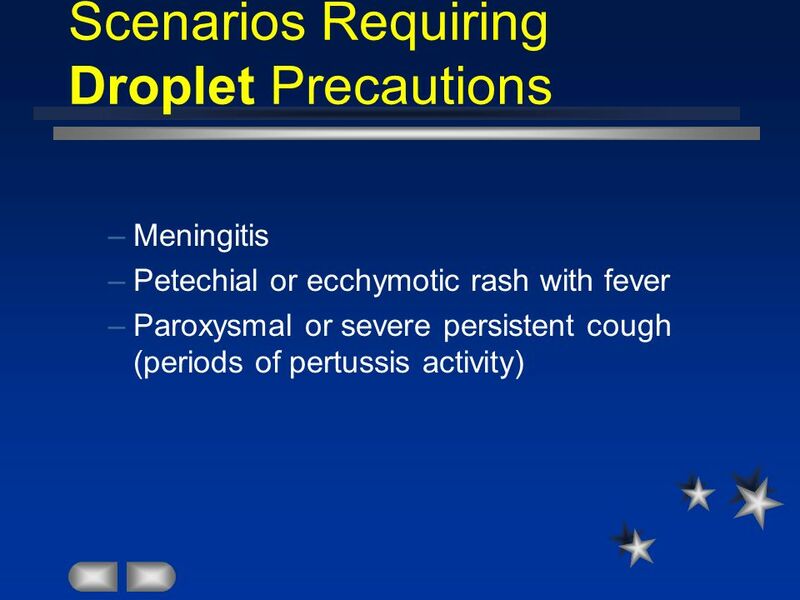 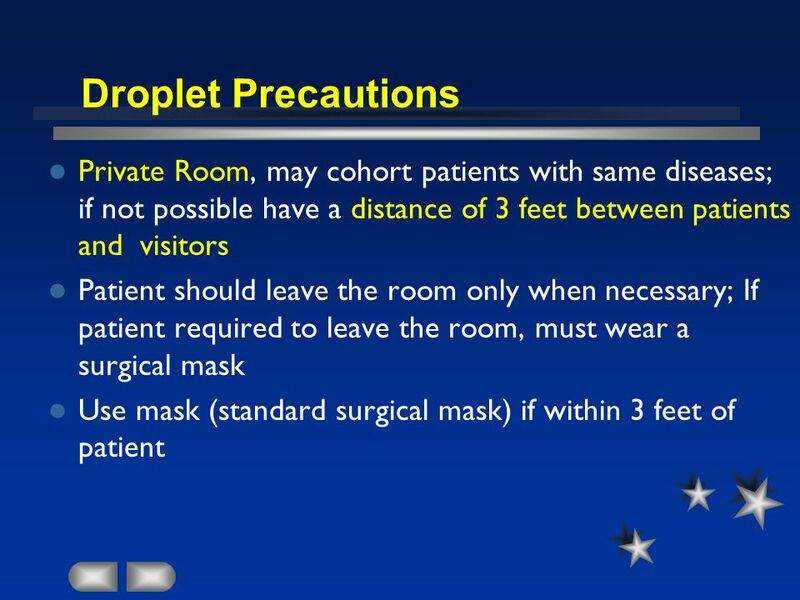 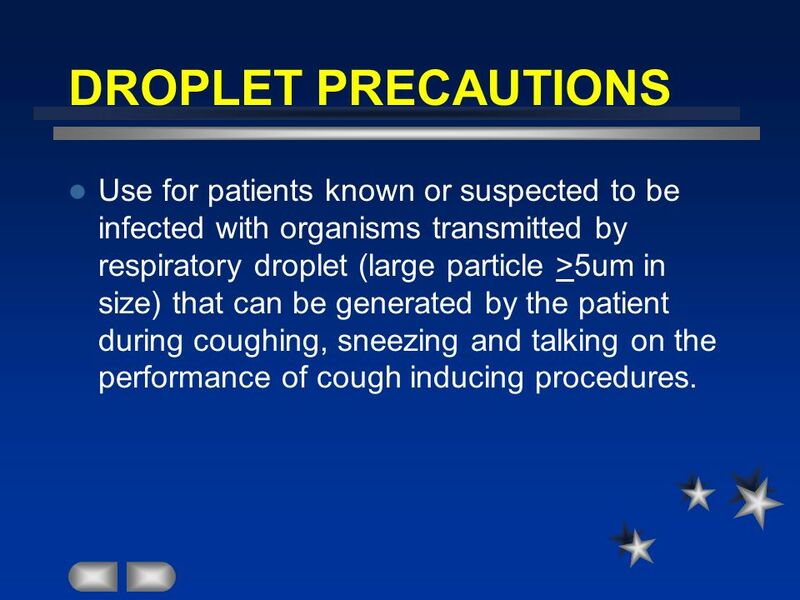 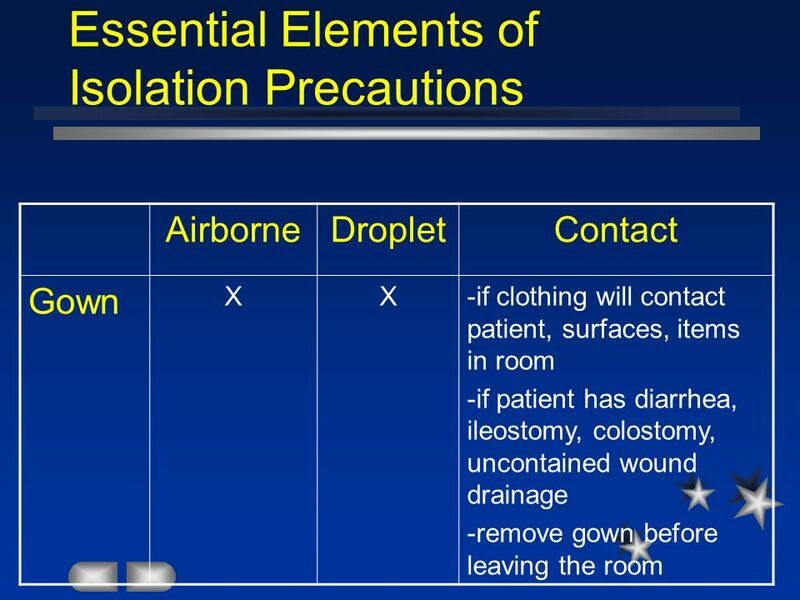 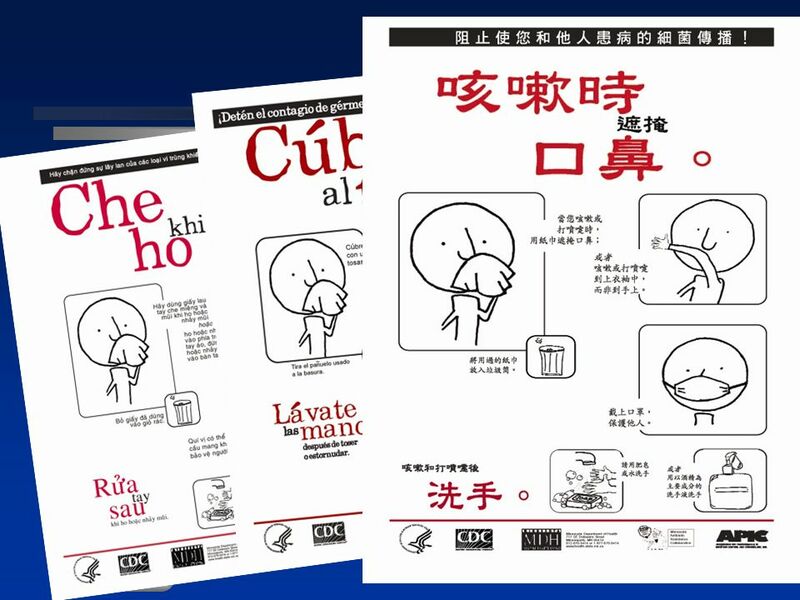 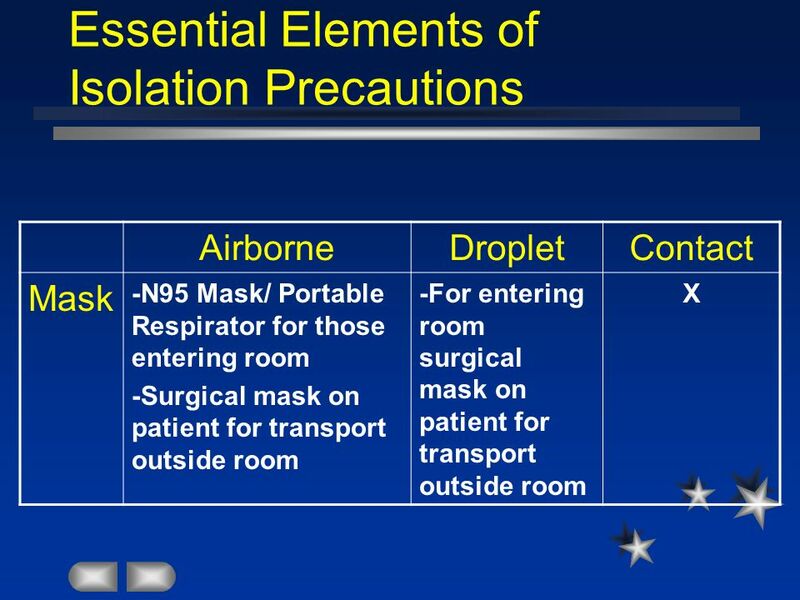 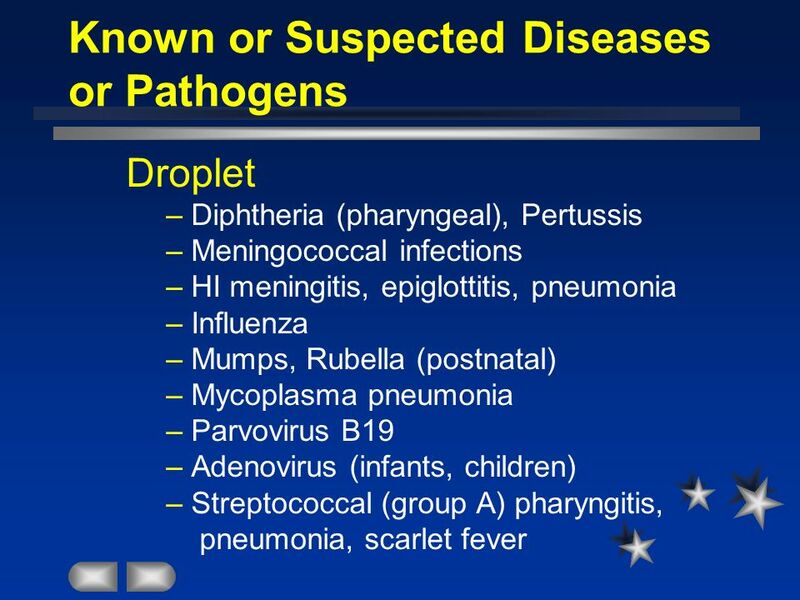 42 DROPLET PRECAUTIONS Use for patients known or suspected to be infected with organisms transmitted by respiratory droplet (large particle >5um in size) that can be generated by the patient during coughing, sneezing and talking on the performance of cough inducing procedures. 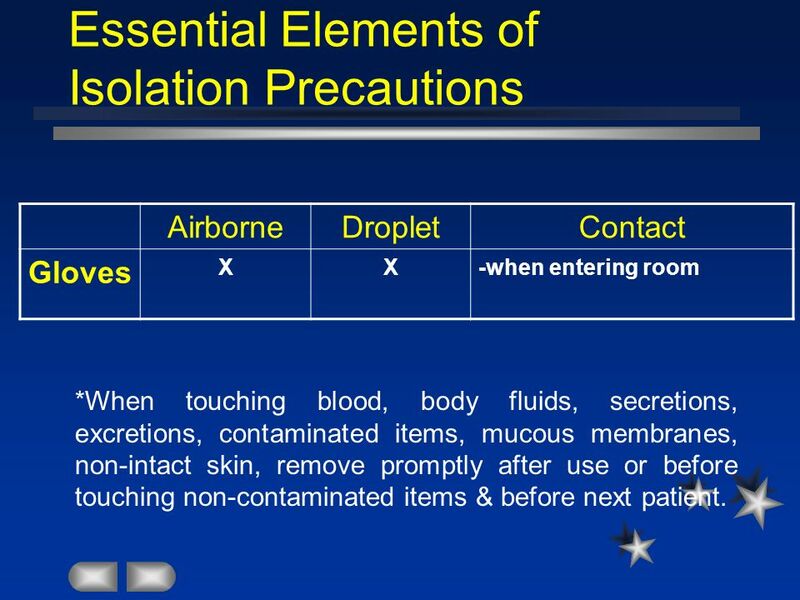 Airborne Droplet Contact Gloves X -when entering room *When touching blood, body fluids, secretions, excretions, contaminated items, mucous membranes, non-intact skin, remove promptly after use or before touching non-contaminated items & before next patient. 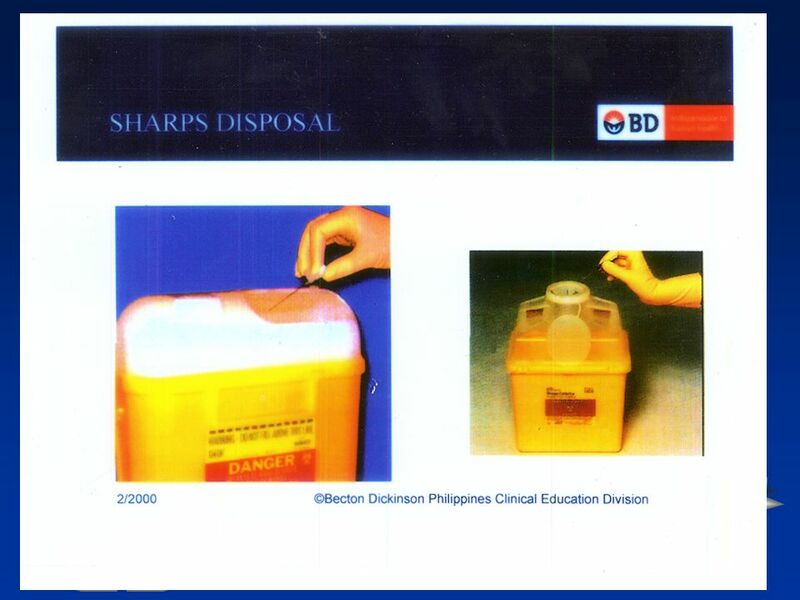 58 1 A 20-yr old employee was admitted for blood-streaked sputum & weight loss. 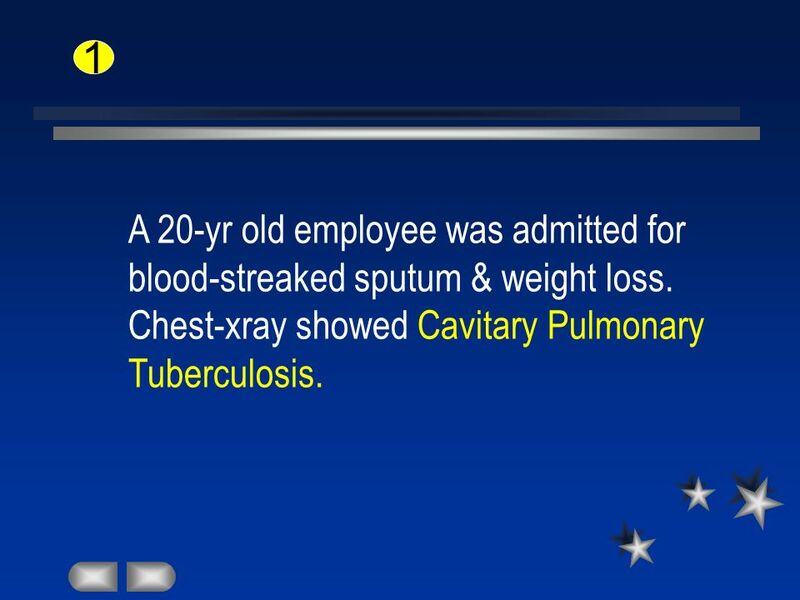 Chest-xray showed Cavitary Pulmonary Tuberculosis. 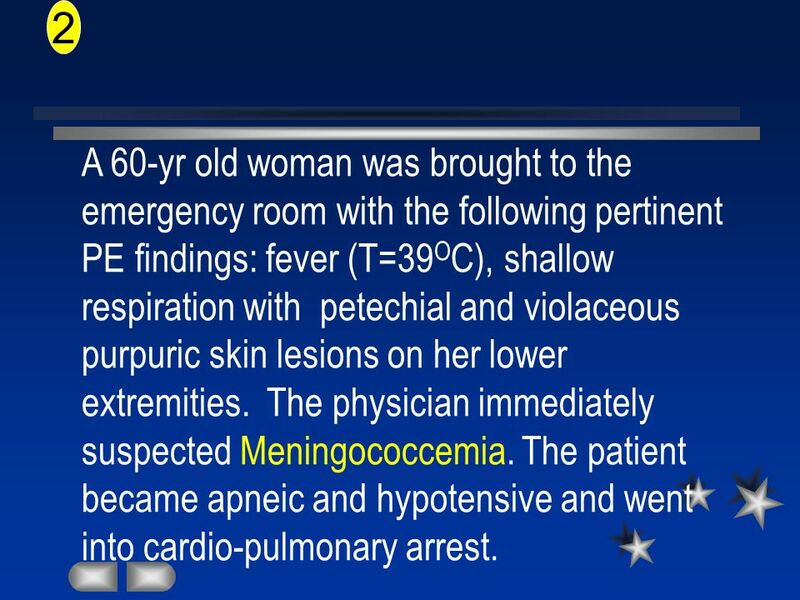 60 2 A 60-yr old woman was brought to the emergency room with the following pertinent PE findings: fever (T=39OC), shallow respiration with petechial and violaceous purpuric skin lesions on her lower extremities. 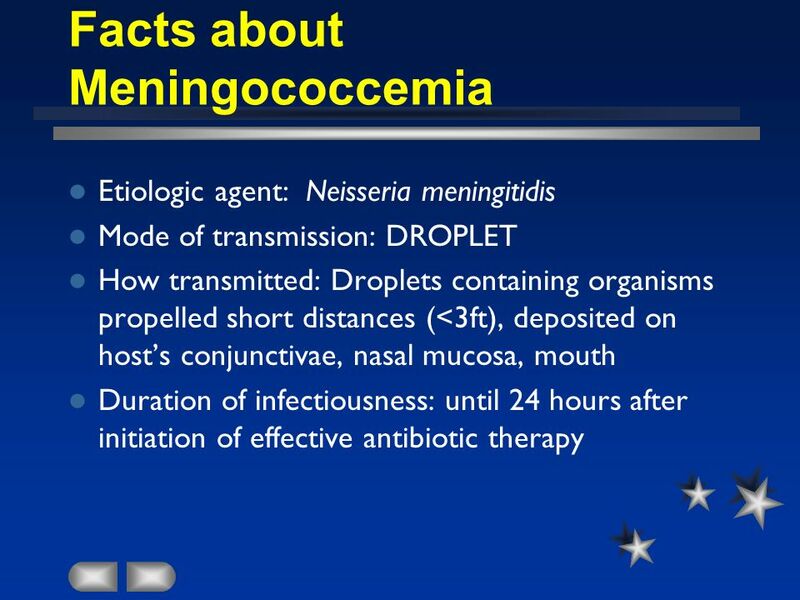 The physician immediately suspected Meningococcemia. 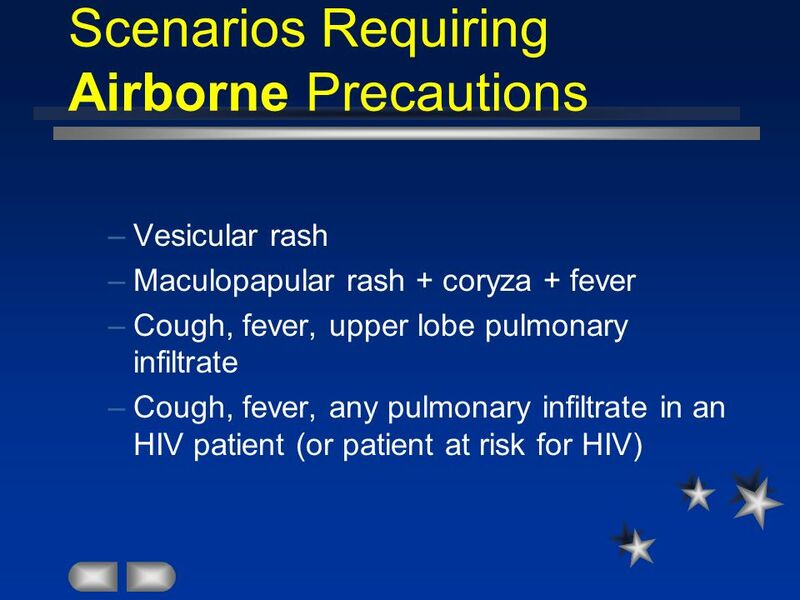 The patient became apneic and hypotensive and went into cardio-pulmonary arrest. 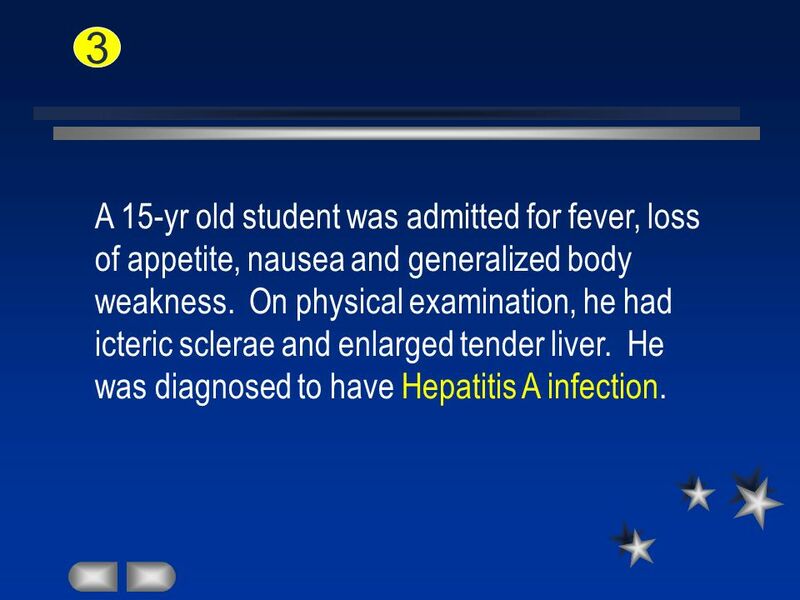 62 3 A 15-yr old student was admitted for fever, loss of appetite, nausea and generalized body weakness. 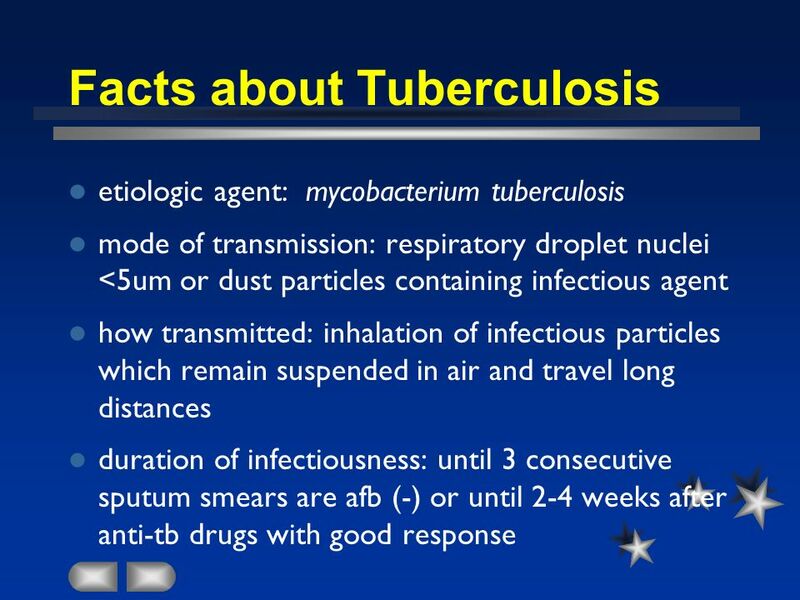 On physical examination, he had icteric sclerae and enlarged tender liver. 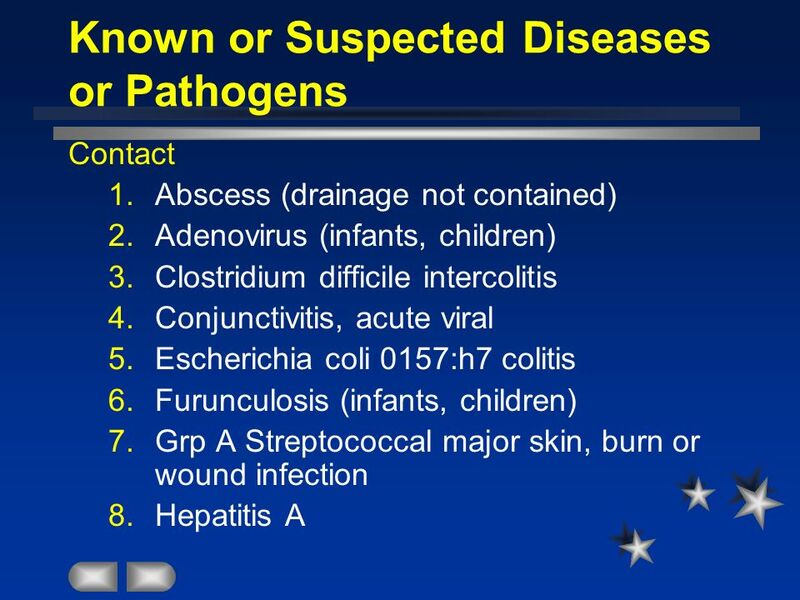 He was diagnosed to have Hepatitis A infection. 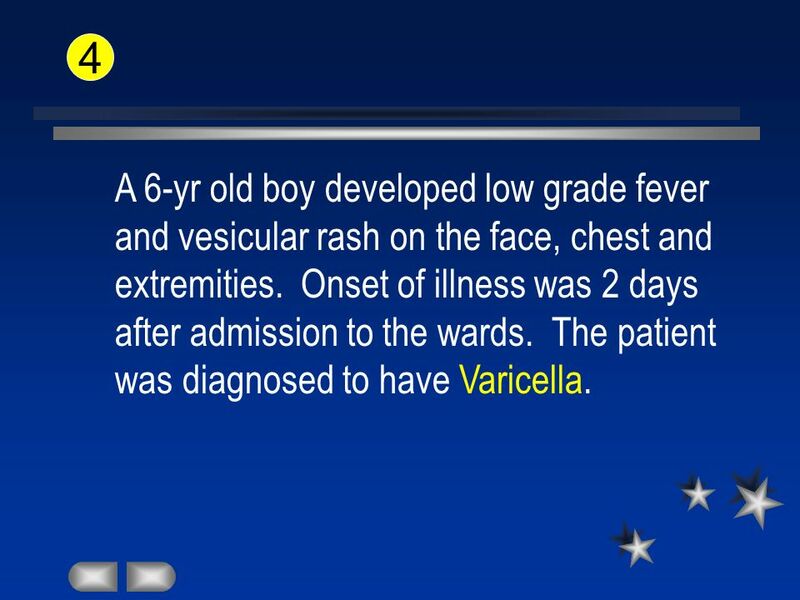 64 4 A 6-yr old boy developed low grade fever and vesicular rash on the face, chest and extremities. 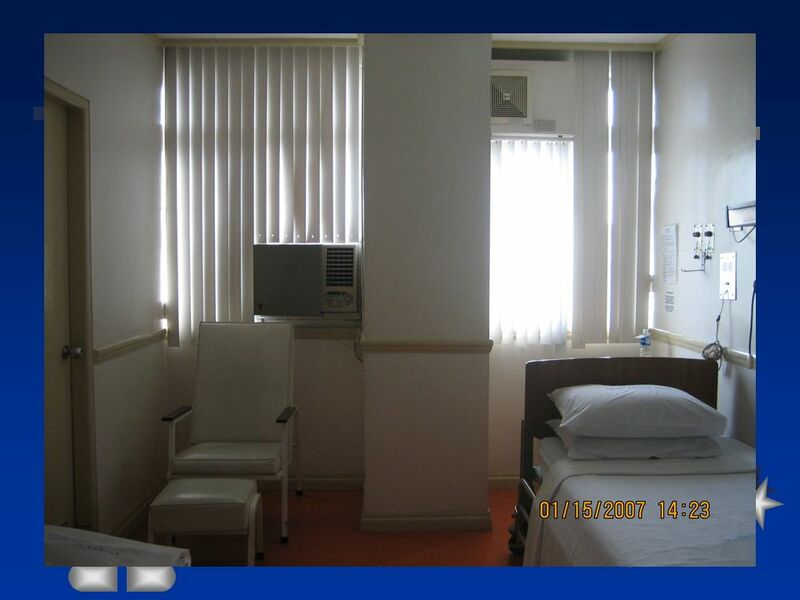 Onset of illness was 2 days after admission to the wards. 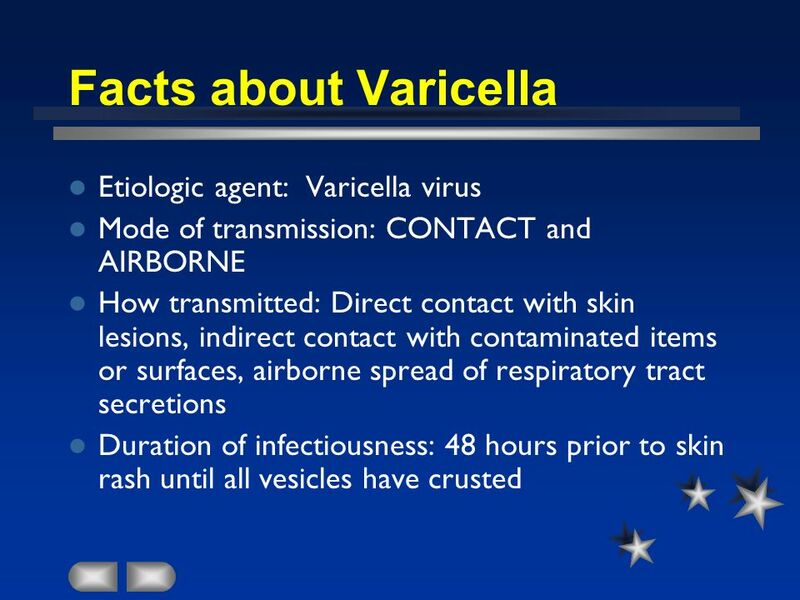 The patient was diagnosed to have Varicella. 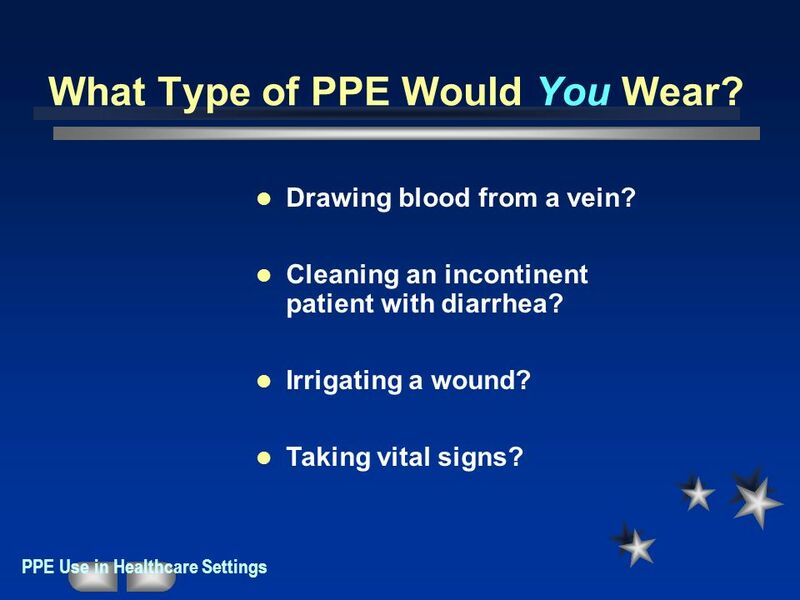 66 What Type of PPE Would You Wear? 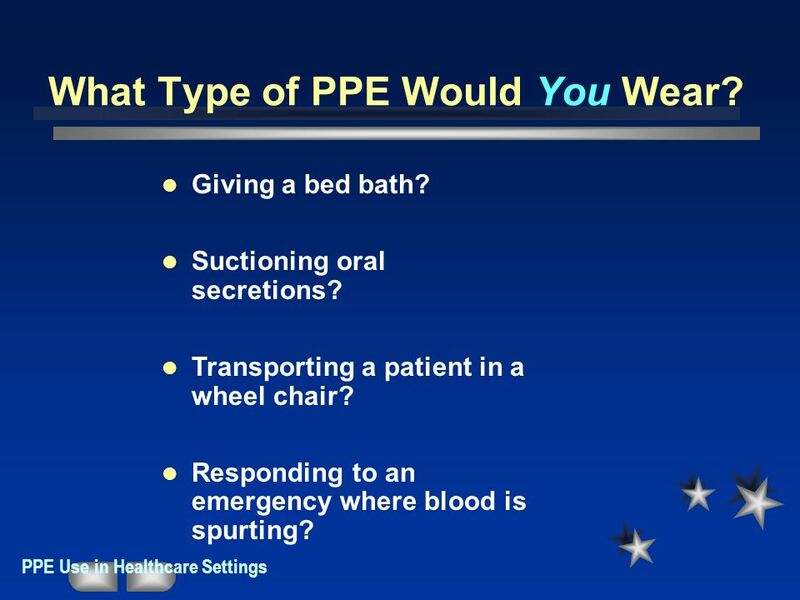 67 What Type of PPE Would You Wear? 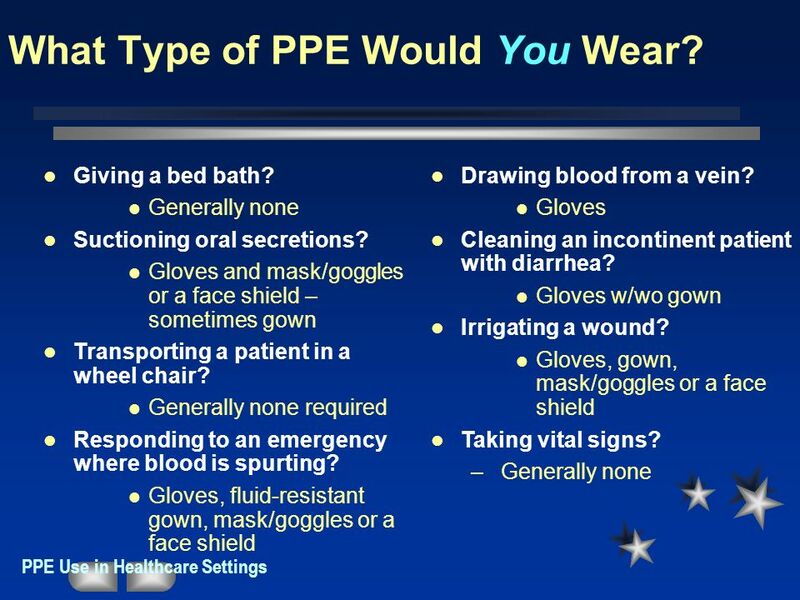 68 What Type of PPE Would You Wear? 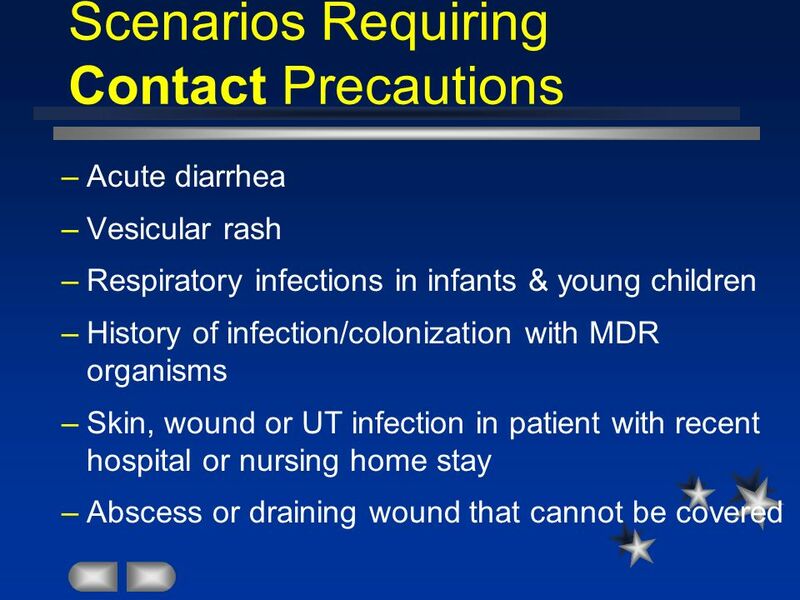 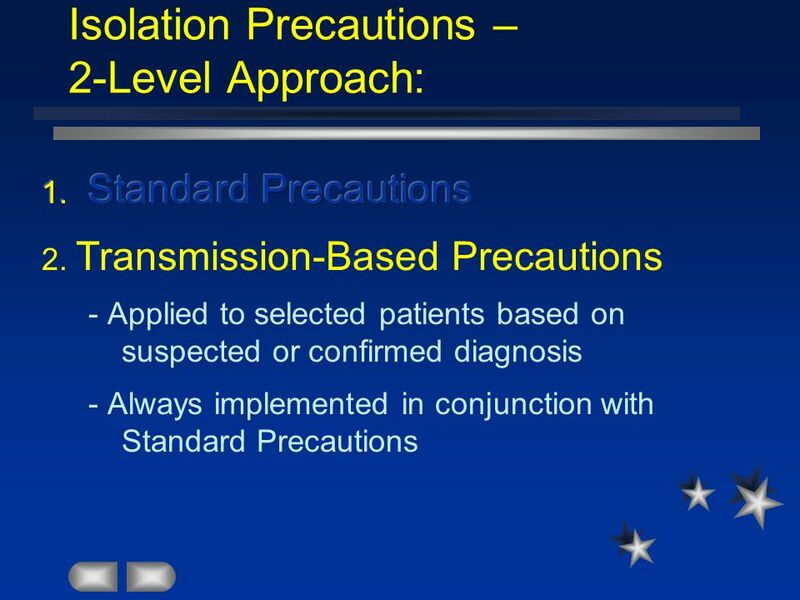 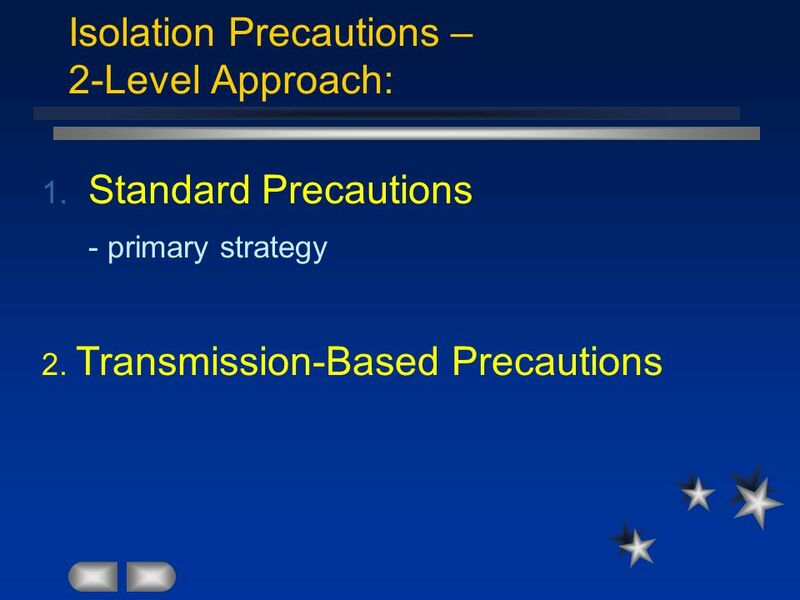 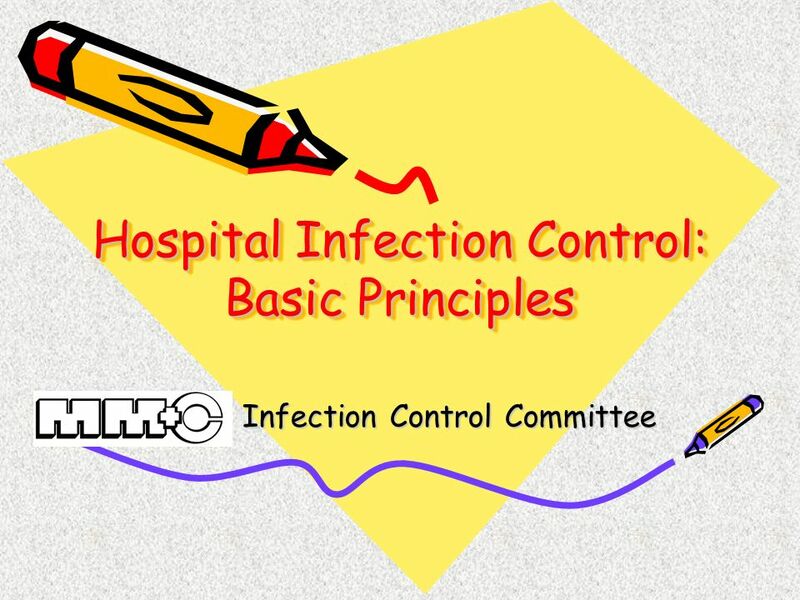 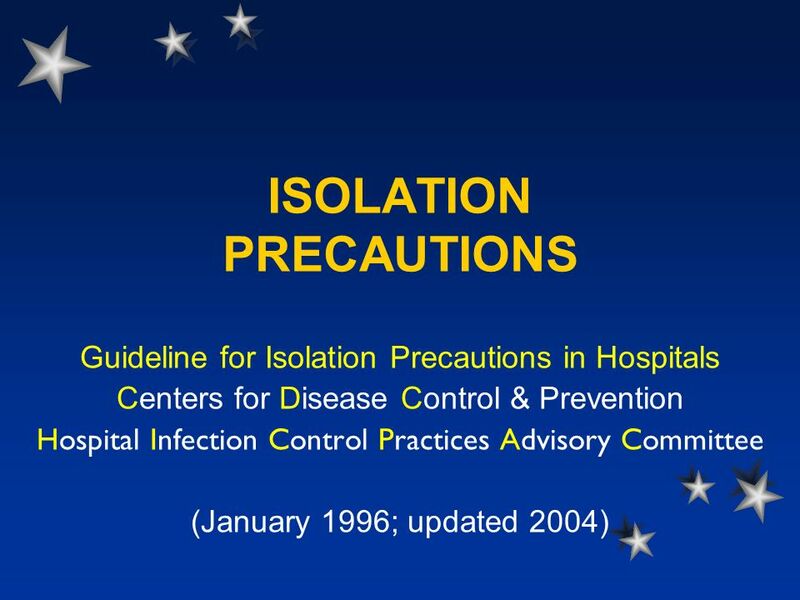 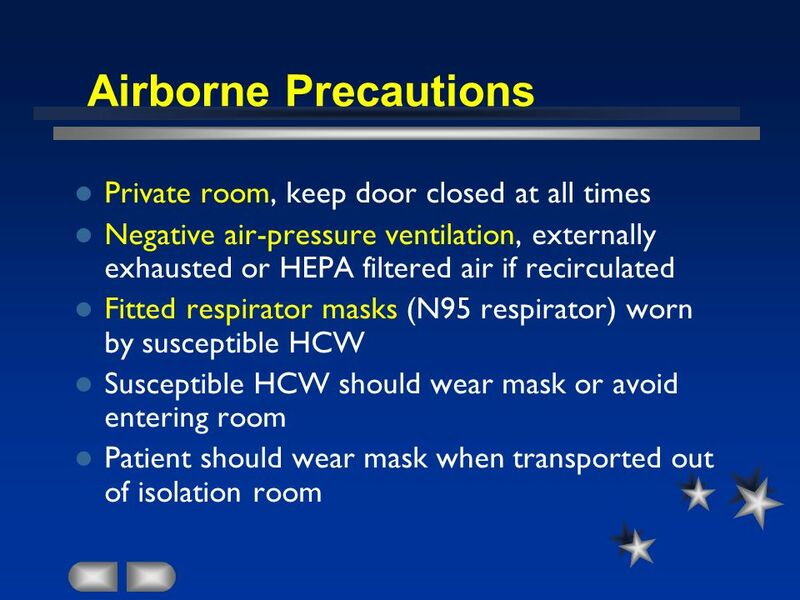 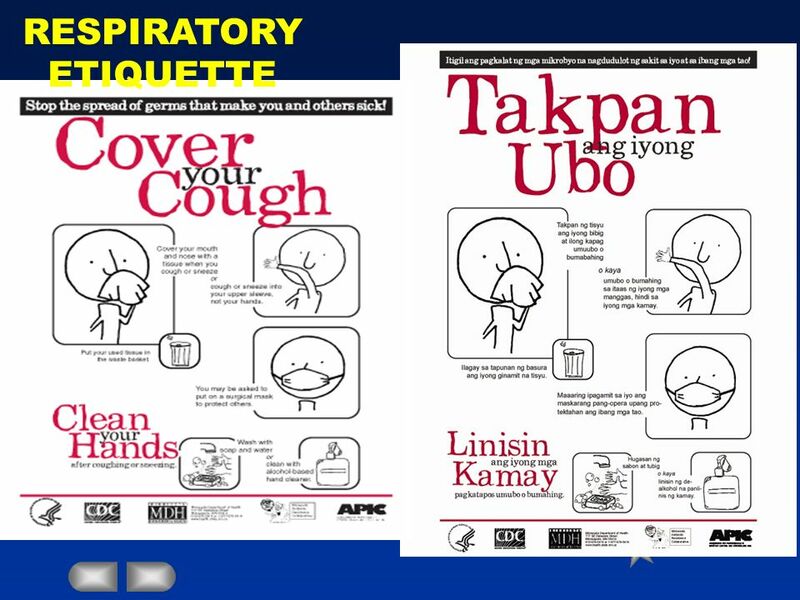 Download ppt "Hospital Infection Control: Basic Principles"
Emergency Medical Response You Are the Emergency Medical Responder Your police unit responds to a call for a medical emergency involving a man who has. 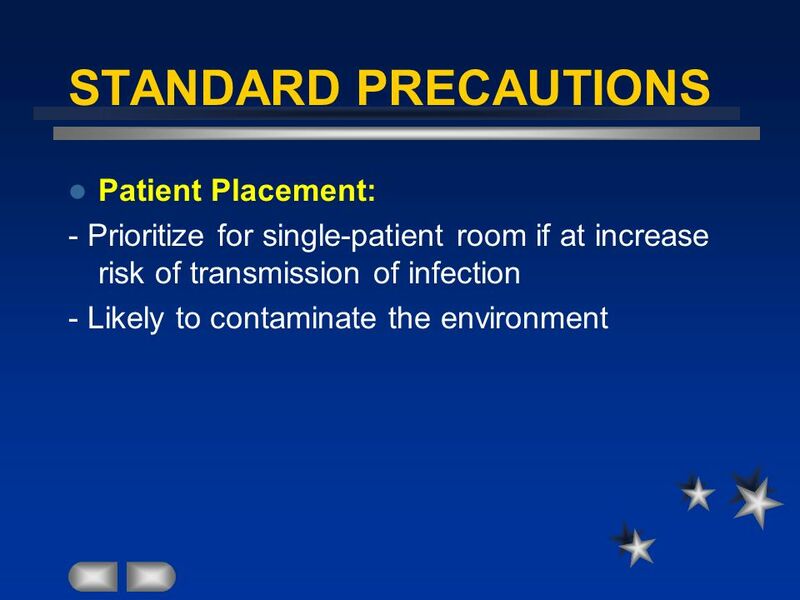 Infection Control in the Emergency Room. 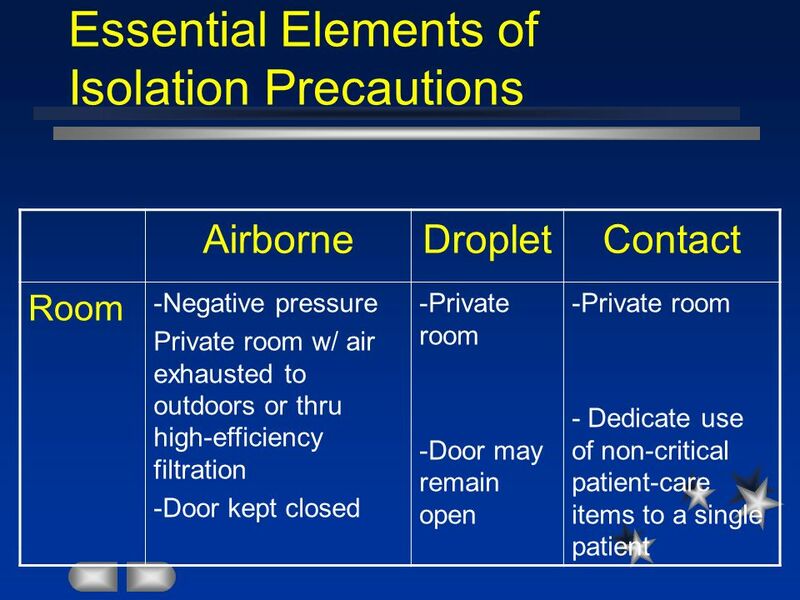 Where the agent enters the next host (Usually the same way it left the old host ) AGENT SUSCEPTIBLE HOST RESERVOIR. 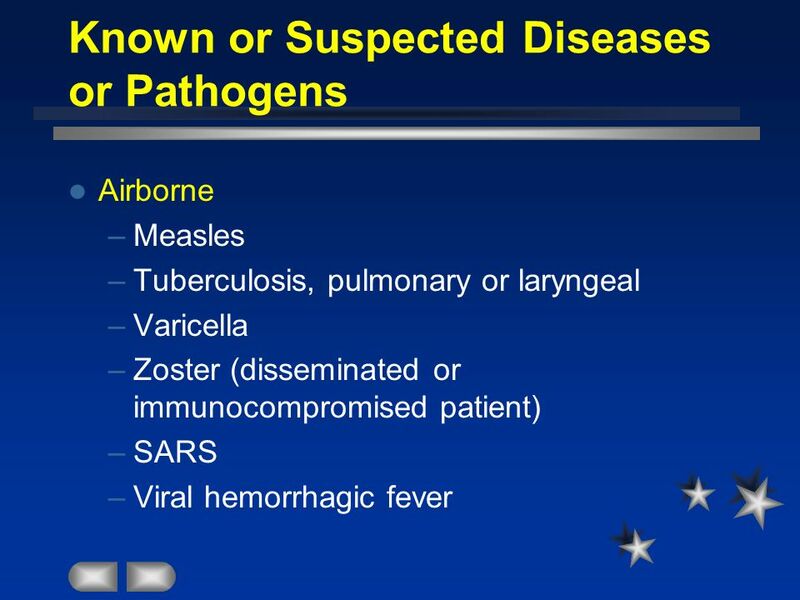 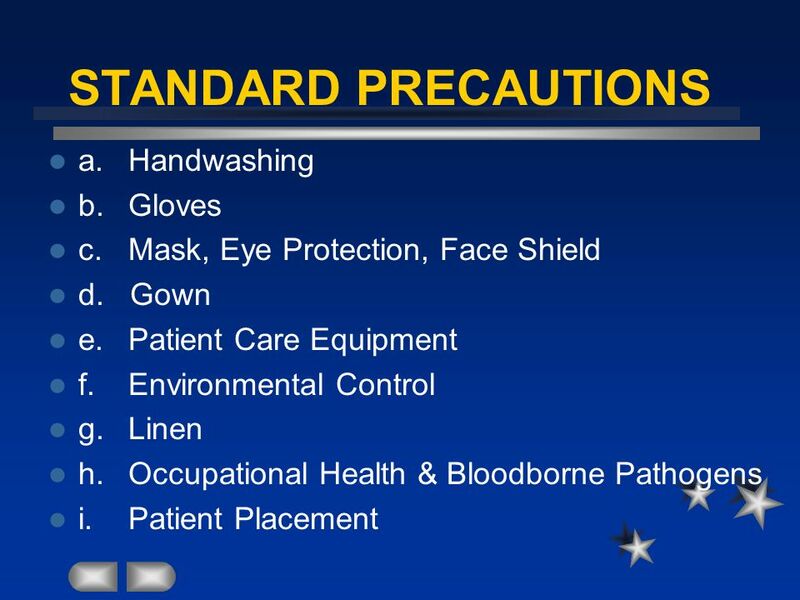 OSHAs blood borne pathogens standard A written exposure control plan designed to eliminate or minimize worker exposure Compliance with universal precautions. 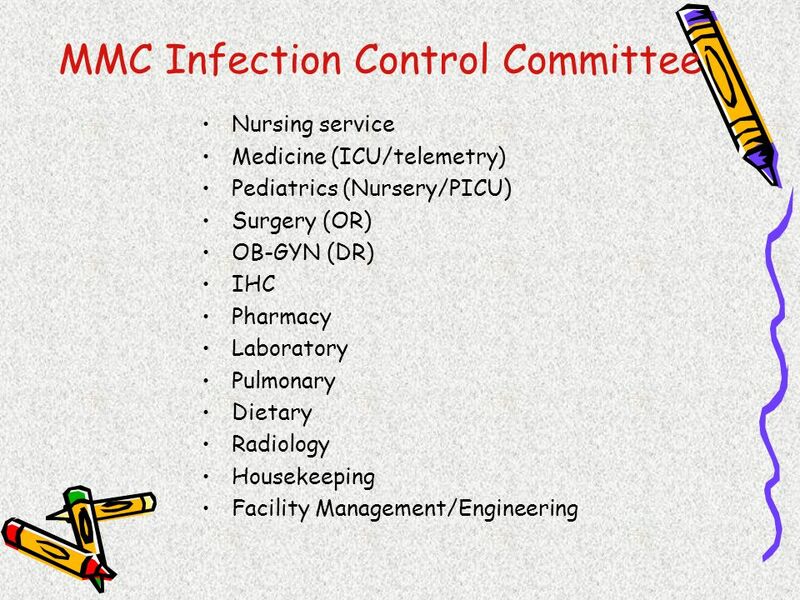 THEIN SHWE, MPH, MS, MBBS HEALTHCARE ASSOCIATED INFECTION COORDINATOR DIVISION OF INFECTIOUS DISEASE EPIDEMIOLOGY OFFICE OF EPIDEMIOLOGY & PREVENTION. Infection Control Warning: blood and guts to follow ! 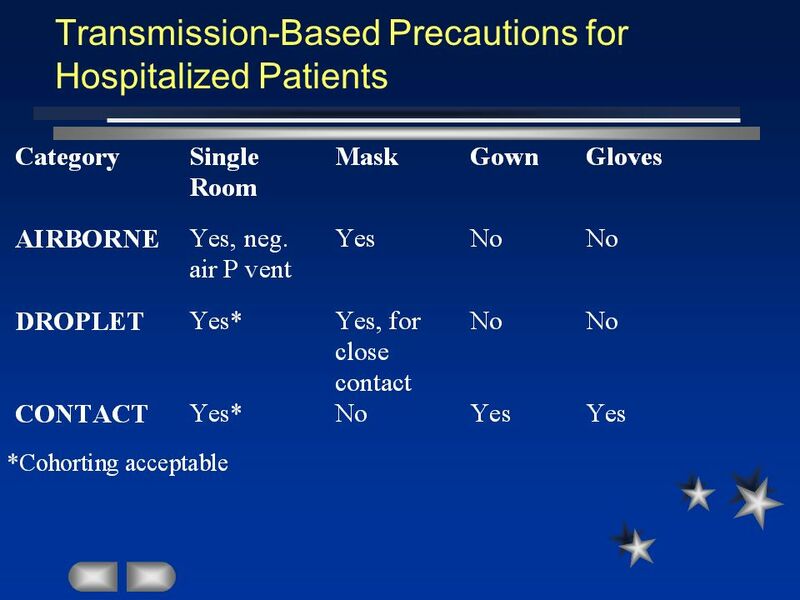 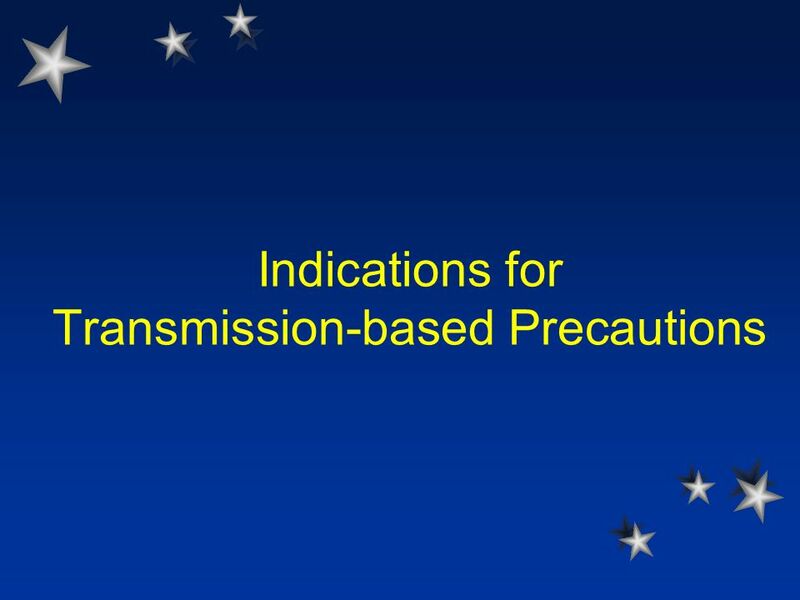 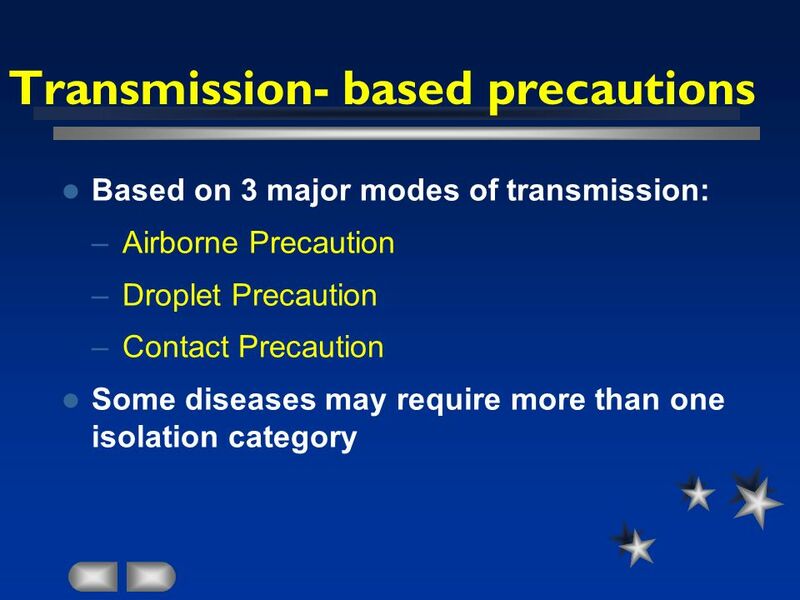 Disease Transmission Precautions. 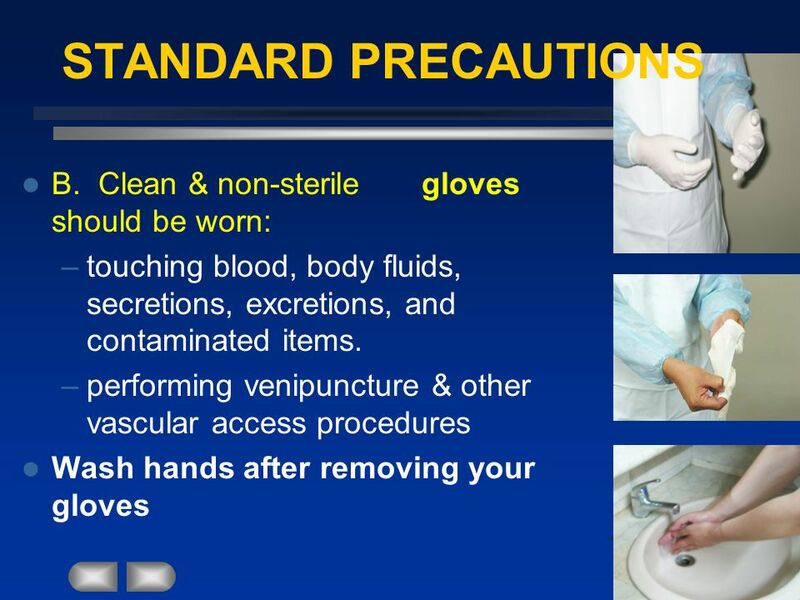 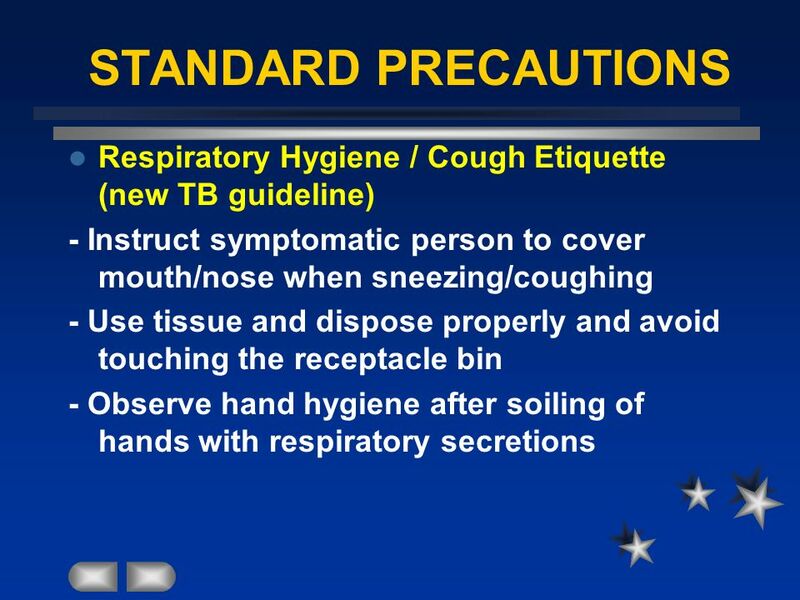 Standard Precautions These are applied to all __________________ at all times because not all diseases are readily observable. La Salle University School of Nursing & Health Sciences Occupational & Safety Health Administration (OSHA) Orientation for Faculty.